With each week that passes, I have been cramming a bounty of new horticultural knowledge into my brain. The half term break is just around the corner and I am more than ready for a breather. It’s not the learning of a new subject that is taking its toll, but the physical side of the course. Having spent previous years reading law and discovering an ability to digest tedious amounts of dull information in a limited amount of time, I felt I would be well prepared for the academic side of learning a new subject, no matter what. 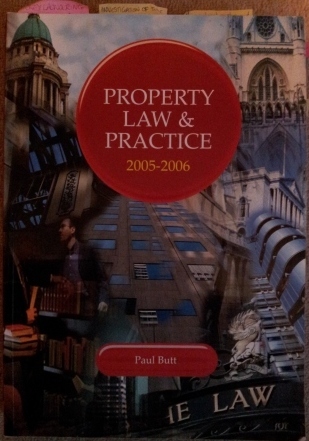 I recall one particular low point in the past when I had to read chapters 14-24 of a property law book in one evening. It was all about procedure leading to exchange in a conveyance. It was far from gripping. Over 150 A4 pages of black print on a white background. There were no pictures apart from the ones I may have drawn to distract myself from the soporific effect the text was having on me. I always had a hate hate relationship with land law and I can tell you now that this feeling carried through when I had to study its elevated cousin – property law and practice. 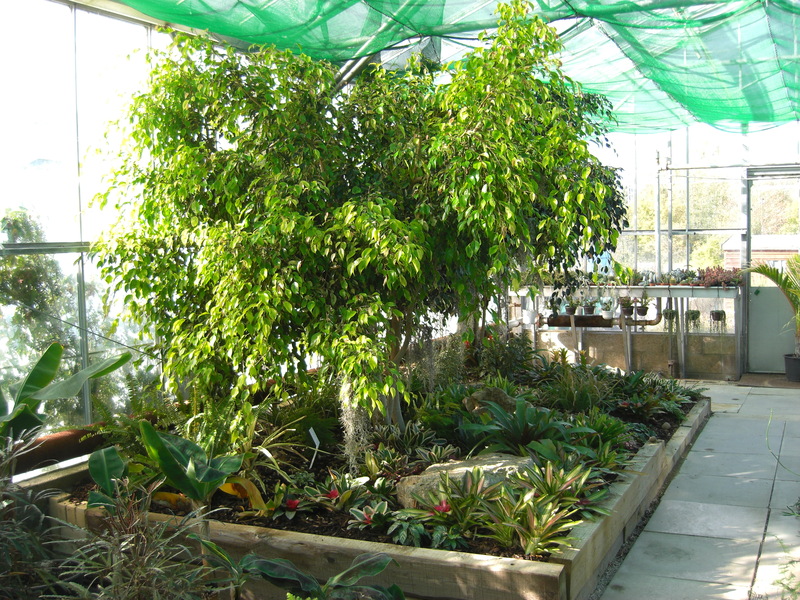 However, the horticulture course, in all aspects so far, is fascinating. 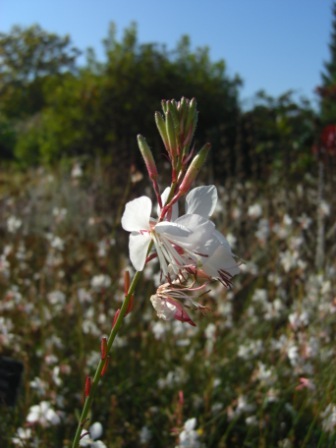 Last week I was swotting up on my botany in preparation for a plant identification test on Friday morning. Then I was swatting down overgrown weeds with a petrol powered strimmer blade in the afternoon. garden design students a couple of years ago, but was suffering from neglect and there were a number of bare patches need attention. 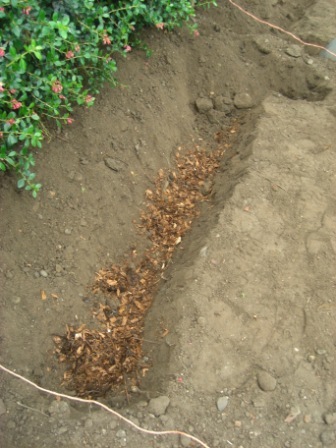 Full of enthusiasm, I helped select approximately 20 plants and arranged them in the gaps, eager to hide the bark mulch that lay thickly over the gritty sandy bed beneath it. 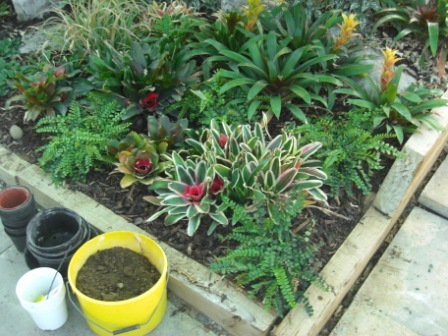 Having decided on the arrangement, I quickly noted it is quite tricky planting bromeliads in the small spaces between the existing serrated edged plants. I also discovered I could not stand up straight to dig in the plants I had selected from the nursery benches because I was confined by the overhanging tree. Undeterred (and quietly cursing under my breath) I began the process of lifting the plants from their pots and digging them in. After the best part of the day’s work, I stood back from the completed garden to observe my improvements. It made the cuts and grazes up my forearms from a couple of vicious Neoregelia carolinae ‘Tricolor’ plants worth it. I may have smelt like bad eggs from the stagnant water spilt over my jeans from a pot plant that had had no drainage holes in it, but I was proud. It was about then, as I was standing upright and congratulating myself on inventing new yoga positions in order to dig holes without treading on my Calathea zebrina, that my lower back started grumbling. The physical fatigue was setting in. The next morning, I bounded into my botany class, completed the test then had a quick coffee break before filling up a wheelbarrow with horse manure and heading up towards an old rose bed. Now, I had almost recovered from the day before, but not entirely. By my third trench, I was flagging. Fortunately, my classmates and I finished the job in time for lunch. We all refuelled and marched down to plant machinery where we picked up the strimmers and hedge trimmers ready for our next task. I learnt many a useful thing that day. 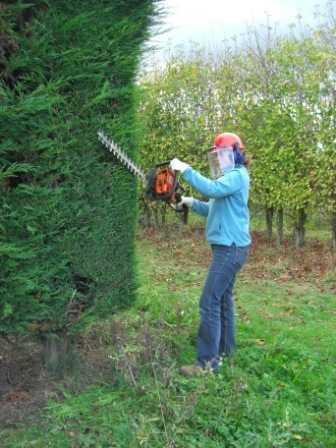 What will stick in my mind, apart from the fun I had chopping things up and cutting things down, is this: If you have to trim a hedge any higher than four feet using a two stroke engine powered hedge trimmer, don’t spend the morning and previous day digging. I was shattered and my arms were on the verge of trembling from lifting the weight of it. On the plus side, I slept like a log that Friday night without the need to pick up a property law book to help me drift off.